The MCACS holds educational scientific meetings valuable for maintenance of certification (MOC) self-assessment CME credits needed for American Board of Surgery accreditation. The flagship meeting, the MCACS Annual Meeting, is held annually in May at various Michigan locations. This meeting includes research competition presentations from surgical residents across the state as well as nationally recognized speakers in fields such as general surgery, vascular surgery, colorectal surgery, trauma and critical care, surgical oncology, transplant, surgical education, and surgical ethics. Either the executive director or the president of the ACS attends this meeting, informing members about ongoing efforts of the College, and is available to speak to members informally on a one on one basis. The Chapter collaborates with the Michigan Committee on Trauma (MCOT) and dovetails the MCOT-sponsored trauma symposium into the MCACS Annual Meeting. The Chapter provides for networking with other surgeons to enhance job opportunities and partnerships and can be an invaluable asset to you and your practice by allowing you to get involved on a level of the American College of Surgeons where you can truly effect change and make a difference. The precursor of ACS chapters was formed in Chicago about 1916, when the College itself was very young. The sole function of this group was to collect and distribute information on clinics in the city’s hospitals. About 1922, the College endorsed the formation of local groups to be called “Chapters” and to function under the banner of a city or state. Early city groups were formed in Cincinnati, Memphis, Brooklyn, New Orleans, Honolulu, Houston and Edmonton (Alberta). The first state chapter appears to be Nebraska, organized in 1924. The earliest chapters appear to have been semi-formal groups and it was not until December 9, 1930, that bylaws for a Brooklyn-Long Island chapter were formally approved by the College. Later, the chapter was granted Charter Number One by the Regents who placed precedence on the approval dates for charters. The rate of chapter formation started to pick up in the mid 1930s to early 1940s. These chapters were nationwide in scope and ranged from West Virginia in the east (about 1932), Louisiana in the south (May, 1939), Minneapolis in the north (June, 1941), and Southern California in the west (also June, 1941). There was a hiatus for new chapter formation during the war years but soon after, the Georgia chapter was formed and held its first meeting in Atlanta on October 31, 1946. A major impetus for new chapter formation occurred in 1949 when the Board of Governors recorded strong support for the establishment of local chapters. The September 15 1951 Bulletin indicated that as of January 1, 1951, there were 17 active chapters of the College and this was followed by a crescendo of enthusiasm for chapter formation. A November 1951 report to the Governors noted 32 active chapters. As of December 1952, 45 chapters were noted and the September-October 1953 Bulletin noted 49 chapters. Chapters were not limited to the United States and Canada and the College did not uniformly endorse every proposed charter. The Regents, in meetings on September 20 and 21, 1952, had encouraged organization of a chapter in Venezuela but not in Argentina. Enthusiasm to establish a chapter in Michigan took solid form in the early 1950s at the height of the era of new chapter organization. If any one person is to be given credit for the early success of the MCACS, it is Doctor Fredrick A. Coller. A 1954 issue of the Bulletin lists 51 chapters of the College and identifies Fredrick A. Collier, Ann Arbor, as Michigan Chapter President, and John Reid Brown, Detroit, as Secretary/Treasurer. Most of the 51 chapters listed were state chapters with one chapter per state, but some states had more than one chapter, while other states had none. Although Michigan has only one chapter, the state’s relatively large population helps account for the chapter’s large size. The 1954 list also noted chapters beyond the North American continent. The jewel of the MCACS has been the Resident Surgeons Day where young residents of exceptional quality present research papers. The Annual Meeting of the MCACS is a two-day affair, usually in early May and hosted by Fellows in various parts of the state. For many years, residents presenting papers competed for a single award, the Fredrick A. Coller Award, and the entire Resident Surgeons Day was informally known as the “Coller Competition.” Over the years, various modifications took place. Early additions recognized the best trauma paper given under the auspices of the Michigan Committee on Trauma and the best cancer paper designated the Danto Cancer Award and given under the auspices of the Cancer Liaison State Chair. More recent awards include the Transplant Award and the Emerick Szilagyi Vascular Award. The most recent addition, the Alexander J. Walt Award was established in recognition and memory of Doctor Alexander J. Walt, who served as Chairman of the Board of Regents and President of the ACS. Selection of papers for presentation as well as preparation of a program designed to appeal to Fellows and residents in areas of topical interest is a function of the Program Committee. The Chapter Council is responsible for oversight of the Program Committee, the state cancer program, the Michigan Committee on Trauma, and interaction with the ACS. By tradition, the sitting President of the ACS is invited to every Annual Meeting of the MCACS as a major participant in the program. The President’s responsibilities generally include service as Chief Judge for the resident competition and “Remarks” to the residents at the Thursday luncheon. 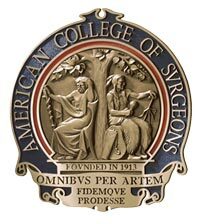 The MCACS – organized in the early 1950’s – was, and continues to be, a group of Michigan surgeons, Fellows of the College who meet in camaraderie to enhance the science and art of surgery and provide encouragement to those who are the future of surgery, our surgical residents. Although not the first ACS Chapter, the MCACS is one of the largest and, with appropriate bias duly acknowledged, one of the best!